This is my new favorite pizza! Sure, the crust takes a little getting used to. 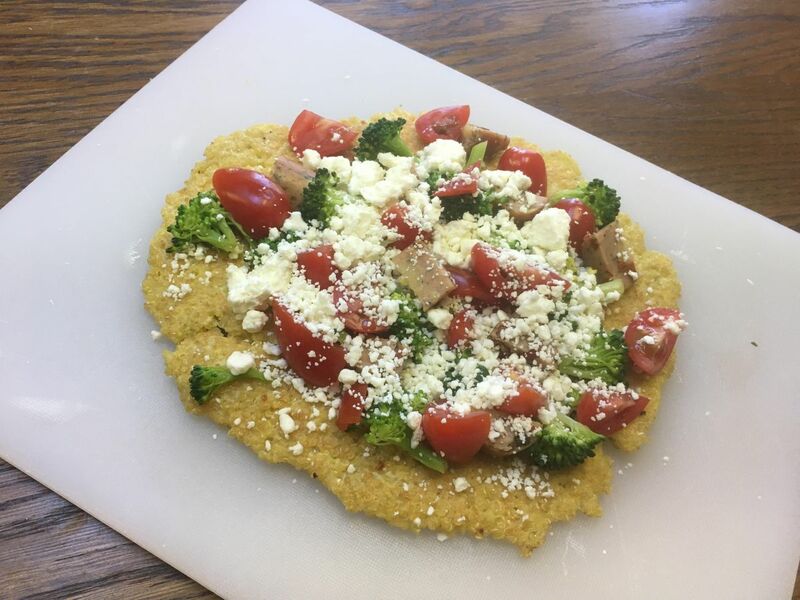 But once you accept cauliflower as a substitute for rice, a pizza crust made out of leftover quinoa is not that much of a stretch. It doesn’t hurt that it happens to be tasty and full of protein and fiber, too! Just like regular pizza, the toppings you choose have a huge impact on the nutrition. I am a fan of a little chicken sausage, a lot of veggies, and a modest amount of cheese. Mozzarella cheese works just fine, but try doing feta, Parmesan, or another stronger cheese. Boulder flavored cheeses let you put the less on the pizza without compromising on overall taste. Preheat your oven to 425° and line a cookie sheet with parchment paper. Mix together the quinoa, eggs, pesto, and mozzarella. Bake this crust for 30 minutes. Add your favorite toppings, and bake until the cheese is nice and melty. Enjoy! If you’re adding meat, try sautéing it with mushrooms before adding it to the pizza! The mushrooms absorb the flavors, so you can use a lot less meat. I use regular pizza sauce on this, but just a little. Too much sauce will make it soggy. Try diced sundried tomatoes instead. Such a pop of tomato flavor! My favorite combination is roasted garlic chicken sausage, sautéed mushrooms, sundried tomatoes, and feta cheese. A serving of this combo is around 400 calories and 25 grams of protein. I didn’t break down all the nutrition, because it varies so much based on the toppings you choose. Have fun cooking up a healthy pizza! Check back next month for another healthy, easy, family-friendly meal!